Plays were often staged in the houses of the nobility as well as at Court. 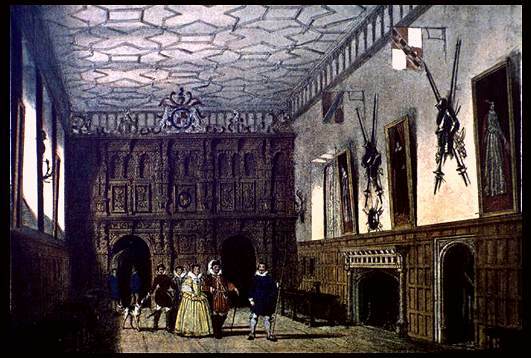 This view of the Great Hall at Knole House* shows the typical wooden screen with two doors. Note the similarity with the surviving sketch of the Swan Theatre, also drawn with two doors. Plays acted here, however, would not have benefit of a trapdoor in the floor or a space "above" for city walls and balconies. Earlier plays from the period avoided special needs of this kind, often, like the Interludes, requiring only a cleared space among the spectators. Knole House was the home of Thomas Sackville, one of the authors of the early English tragedy Gorboduc. Gorboduc was performed before Queen Elizabeth on January 18, 1562, two years before Shakespeare was born. Thus the play is likely to have been acted in this hall.